Jacob Javits Center Friday November 16th at 12 noon and 2 PM. 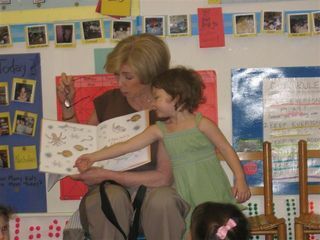 Lynne at the Claremont School in Manhattan, May 10, 2007 with her daughter/teacher extraordinaire, Dinah. Lynne and little Aury at St. Ann's School in Brooklyn, NY on April 30, 2007. "The Creative Worlds of Lynne Barasch" features several of Lynne's books with interactive stations relating to each title. April 21 2010 Lynne will be at Smithtown Elementary School all day reading to all the grades and talking about the process of making a picture book. April 30 2010 Lynne will visit Hudson Elementary school to present her books. May 1 2010 Lynne will attend and sign books at the Hudson Children's Book Festival in Hudson NY.